Stackable wooden shoe rack in walnut has a great look and when used stacked, is a real clutter buster when it comes to shoe storage. 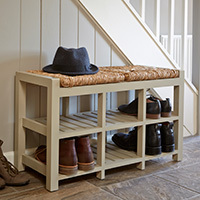 Stylish shoe storage bench with 3-drawers which is finished in a choice of Oak or Walnut. A quality seat and shoe storage solution in one for the hallway. Holds 15 pairs of shoes. 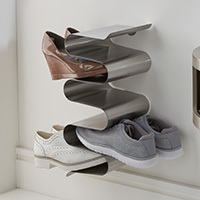 We love this trendy brushed stainless steel designer shoe rack. By popular demand we've made this longer version for storage of up to 8 pairs of shoes. Folding and stackable mesh shelves at a great price. Perfect for added shoe storage, plus more can be added as your shoe collection grows. Simple and stylish Ashwood shoe bench designed by Sebastian Conran Holds 6 pairs of shoes whilst offering a place to sit. 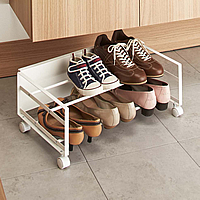 Low profile 2-tier shoe rack on castors, great for sliding under a bed, hallway cabinet etc. 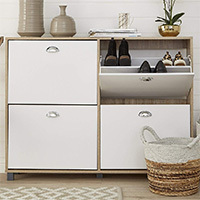 Slimline Scandi style 6-tier shoe storage unit with wooden top and hooks to store bags and brollies. Ideal for locations where space is at a premium. Set of 2 stacking metal shoe shelves designed by STORE favourite Jordan Murphy. Each shelf is finished in a powder coated black metal with vinyl mesh shelves. 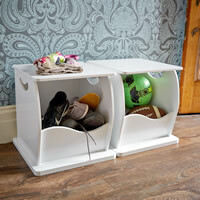 4-tier powder coated shoe rack in white or black with storage space for up to 12 pairs of shoes. Ideal for use in narrow or restricted spaces at only 17.5cm deep. 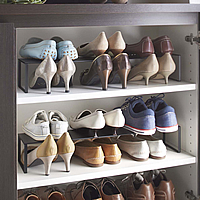 Contemporary shoe storage cupboard which can hold up to 18 pairs of shoes. Crafted from solid oak and delivered fully assembled. 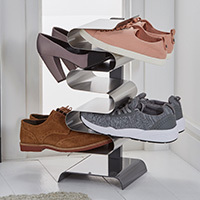 Stackable 2 tier shoe rack which can store 16 pairs of shoes. Great for the hallway or bottom of a wardrobe. Set of 2 brushed stainless steel wall mounted shoe racks. Available in silver and white. 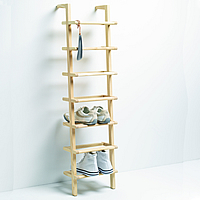 Simple yet stylish space saving shoe rack crafted from untreated ash wood. Great for use where space is at a premium and a traditional shoe rack won't fit. Top quality white stacking and extending 3-tier shoe rack from our designer friends in Japan. Holds 10-12 pairs of shoes per shoe rack. Stylish 4-drawer shoe cabinet from our budget range with wood coloured detailing and muted grey feet. Stores up to 22 pairs of shoes. 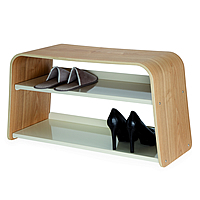 Organise your hallway shoe storage with our neat 45cm wide elfa shelving and shoe rack solution. White wooden stacking storage cube. Great for tidying away shoes and trainers in the hallway. Simple yet stylish shoe rack crafted from untreated ash wood. Can store up to nine pairs for a tidy hallway. Encourage your kid's to tidy-away their own shoes with our stylish wall mounted kids shoe rack. 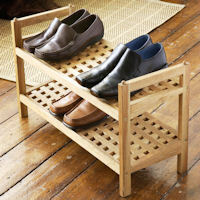 Stackable shoe storage organiser rack with 4 shelves. Can store 12 pairs of shoes, ankle boots etc. 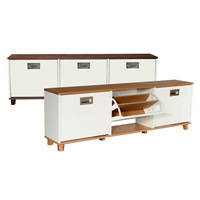 Slimline 4 cubby wooden shoe storage locker. Ideal for tidying away shoes, trainers, football boots etc in the hallway, porch or boot room. 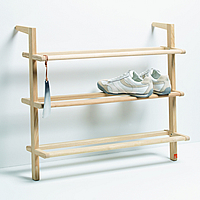 Quality black powder coated steel shoe rack with 2 shelves. Shoes are stored upright making this a great choice for those with limited depth available.